In most parts of the United States, volcanoes aren’t a major concern. But in places like Hawaii and in other parts of the world, volcanoes, lava flows and toxic gases are major concerns. The effects of a volcano can be localized, as with the situation currently unfolding in Hawaii, or widespread, as with the eruption of the Eyjafjallajökull volcano in Iceland in 2010. Volcanoes can disrupt traffic, cause closings, and delays, and most importantly, put people in life-threatening danger. Organizations in areas that may be impacted by volcanic activity need to have plans and tools in place to help facilitate a response that keeps their people out of harm’s way. 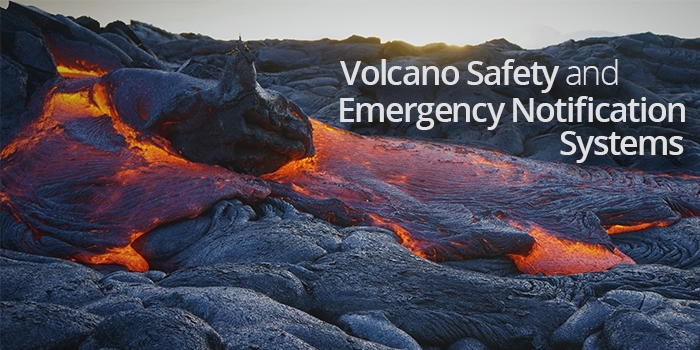 In this blog post, we’ll detail how organizations can leverage emergency notification systems to automatically trigger alerts and provide safety instructions when volcanic activity occurs. Organizations should look for emergency notification systems that can monitor CAP feeds from government agencies to receive automatic alerts when volcanic activity occurs. By filtering the message through an emergency notification system, organizations can send safety information in multiple formats to multiple devices and recipient groups. This increases the likelihood everyone is aware of the situation and can stay clear of any danger. As reported by Vox, the volcanic eruption in Hawaii was accompanied by an earthquake. While the lava flows may garner the majority of media attention due to their tendency to destroy property and infrastructure, volcanic activity can pose other dangers as well. If an organization sets up an emergency notification system to monitor CAP alerts for volcanoes, it should also monitor for alerts associated with other disasters that can be related to volcanic activity. The situation in Hawaii is limited to a small area, and much like an emergency notification system can be used to alert people of danger, it can also be used to let people know they are safe. Providing messages that let people know they will not be impacted by volcanic activity lets them know an organization is aware of the situation and is monitoring it. This helps minimize confusion and avoid unnecessary downtime. If an organization has been impacted by volcanic activity, once officials have deemed the event has concluded, it can also use an emergency notification system to send an “all clear” message. This can be used to provide updates on when a regular schedule will resume, if any property was damaged, and other relevant information to help ensure a smooth transition back to normal. Successful execution of any emergency plan comes from practice and preparation. Whether it’s a volcano, severe weather, or some other natural disaster, letting people know a plan is in place and running drills helps with a smooth deployment should an event take place. The National Weather Service has compiled a state-by-state guide outlining different disaster preparedness weeks throughout the year. Organizations can use this as a planning tool throughout the year. InformaCast emergency notification software is used by organizations around the world to send critical communications about natural disasters. It can monitor CAP feeds to send automatic alerts to devices like IP phones, IP speakers, digital signage, desktop computer and mobile devices in a variety of formats, including live audio, SMS text email and more.